It is natural to sympathize with the underdog - the fellow who is persecuted or "picked-on." How does this apply in God's Church? 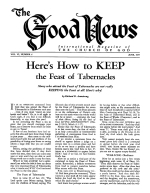 You need to read this article reprinted from the January, 1954, issue. HAVE you ever had what is known as a "suffering hero" complex? Chances are, you probably have. Most of us have it once in a great while, but quickly solve our problem and get over it. But with some people, this complex becomes a fixed mental habit. When these people are denied what they want - even though they don't deserve it - they begin to feel sorry for themselves and to place the blame on others. They usually set out immediately to win sympathy for their "cause." They often lead a great many others into an attitude of bitterness toward those who are supposed to be persecuting them - the "underdogs." Psychologists are quite familiar with this complex. Every organization or business of any size has its share of "suffering heroes." Every political party and religious group has its share.